YANGON — Ma Pan Ei pulls herself together for her unborn child and keeps hope alive that a lawsuit against her husband, Ko Wa Lone, and his colleague Ko Kyaw Soe Oo is dismissed before the girl is delivered. Ma Pan Ei found out she was pregnant a few weeks after the two Reuters reporters were arrested on Dec. 12. Though the journalists have been detained since, she has been able to meet with her husband at each court hearing and visits him at Yangon’s Insein Prison every week. Their meetings at the court can last a few hours at a time, but her prison visits are kept to a strict 30 minutes, often after a long wait. “The news of having my child gives me hope to make it through my time in prison. I have been able to encourage myself not to get depressed,” Ko Wa Lone — whose real name is Thet Oo Maung but is best known by his nom de plume — told The Irrawaddy after a court hearing in June. Ko Wa Lone and Ko Kyaw Soe Oo were arrested after leaving a dinner they were invited to by police in Yangon and had charges filed against them on Jan. 10 under the Official Secrets Act for allegedly possessing classified documents, which could see them sentenced to up to 14 years in jail if convicted. At the time of their arrest, they were investigating the massacre of 10 Rohingya Muslim men in September in Indin village, in northern Rakhine State’s Maungdaw Township. Reuters published a story based on their reporting on Feb. 8 and by April the Myanmar Army announced that seven soldiers had been sentenced to 10 years in jail with hard labor for participating in the extrajudicial killings. On Monday, July 9, the Northern District Court of Yangon will rule whether to charge the two Reuters reporters. The families of both men say they expect the court to drop the case. “We pray and we believe that the judge’s decision at the upcoming court ruling will be the right one,” said Ma Pan Ei. She said her pregnancy has brought joy to the family amid the hardship. “Maung Wa Lone told me he has a future now that our angel is on her way,” she said. U Tin Myint, Ko Wa Lone’s father, said he was optimistic about Monday’s ruling because his son “did nothing wrong.” He said he tells his eldest son to be strong every time they meet, though he has not been able to attend every hearing. “We did not expect this. Now that we are facing this, we feel very sorry,” he told The Irrawaddy. The baby will be his first grandchild. “I feel both sad and happy for my first grandchild because we were expecting this moment [the pregnancy]. But now my son is in prison, so my sadness is beyond words,” he said softly. The families are all smiles when they meet at court under the public’s gaze, but Ma Pan Ei said the cheer is a show to lift each other’s spirits. “I don’t want him to worry, so I try to stay happy and smile as much as I can. I only want him to know that everything is fine. He also always says everything is fine. But we both know the real feeling,” she said. “I just want the father of my child to be released before she is born,” she said through tears. The families of the two reporters insist Ko Wa Lone and Ko Kyaw Soe Oo are not enemies of the state, but journalists and fathers who believe in the truth, respect everyone and reject ethnic or racial discrimination. After one of their court hearings last month, Ko Kyaw Soe Oo told The Irrawaddy that he did not want his daughter to go through what he has had to. “We are facing unjust laws, and we have a poor education system. I don’t want my child to have an attitude of racial hatred and discrimination,” which a poor education system can breed, he said. His daughter, who will turn 3 this month, comes along to every hearing, the only chance she and her father have to play together. Ko Kyaw Soe Oo’s wife, Chit Su Win, hopes her husband will be freed in time for their daughter’s birthday in three weeks. She visits Ko Kyaw Soe Oo in prison almost every day and brings him home-cooked meals. “Even if we live in an apartment, we want to go out. How hard must it be for him being surrounded by those prison walls?” she said. Between prison visits and court hearings, Ko Wa Lone and Ko Kyaw Soe Oo spend much of their time reading and even do a little gardening. In 2017 a total of 11 journalists were arrested under various laws, including the Officials Secrets Act, the Unlawful Associations Act, the Telecommunications Law and the Media Law. 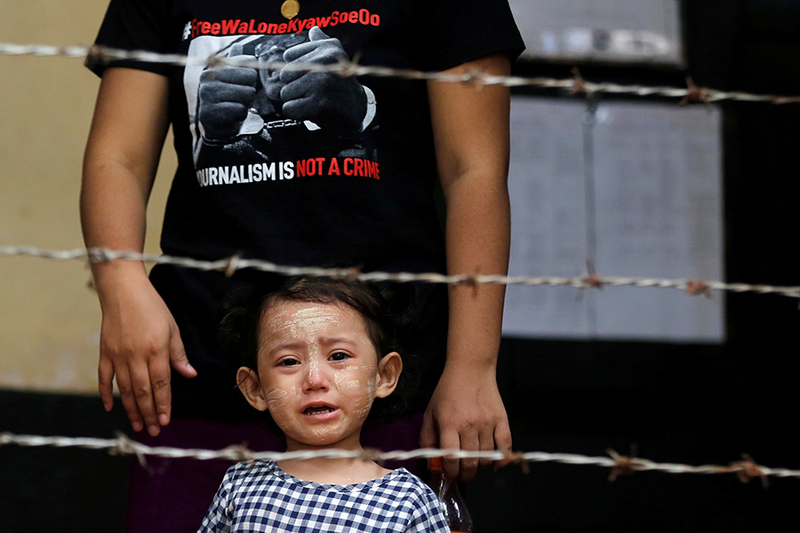 Though the cases against eight of them have been dropped, the two Reuters reporters and an editor for Myanmar Now are still being prosecuted.